Tanto in Shirasaya with Koshirae. Signature : Mumei(unsigned) attributed as Uda school. Aoi Bijyutsu Syoshin Kanteisyo: Gurantee NBTHK Hozon Token. This sword belongs to Jyo saki ranking. Blade length : 23.7 cm or 9.33 inches. Sori : 0.3 cm or 0.12 inches. Width at the hamachi : 2.08 cm or 0.8 inches. Kasane : 0.86 cm or 0.34 inches. Shape : The blade is thick which looks like Yoroi-Doshi style. and shirake utsuri appear on the jigane. Hamon :niedeki tight sugaha hamon and uchinoke hamon appear. Special feature:The Uda school is said to have originated in Yamato province. The founder Kunimitsu moved to Ettyu province in the last Kamakura period. and hard iron commonly called matsukawa-hada or Norishige-hada in Japanese. This sword is a stream of the Uda school at late Muromachi period. Fuchikashira: on the iron plate, silver grass is painted by gold color. Menuki : on the copper plate, some plant is engrave with gold color. a shish dog is playing with some toy. 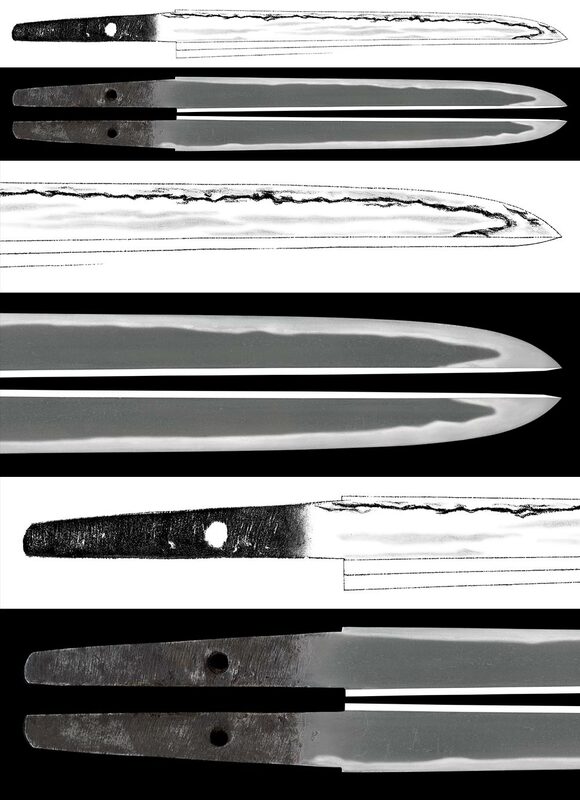 which is typical late Muromachi period Tanto(460years ago) I think pretty nice condition.